Foosa Moon Creations: Winter Song Kit -- New Release! 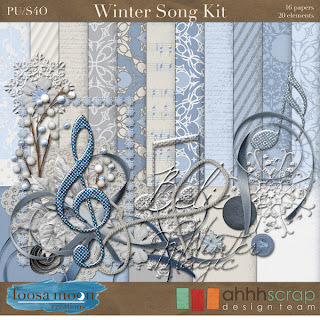 Winter Song Kit -- New Release! After taking a month off for the holidays, I am back with a new release for the new year! I enjoyed my time off, playing with my kids, celebrating my daughter's 10th birthday, and of course Christmas and New Years. Unfortunately my husband had to work both holidays (though he was able to take a personal day to be home on Christmas Day), so we made the most of the stay-cation. My new kit is called Winter Song. Music has always been a big part of my life, whether performing or listening. This kit celebrates music in the tones of the season. Winter in Colorado often means gray skies, snow, and crisp air. Normally. Today is a bright sunny 60 degree day, so we'll just pretend!